Plasma cell dyscrasias are often associated with kidney disease (Figure 26.1). In many cases, this is caused by the nephrotoxicity of the individual monoclonal FLCs produced by a B-cell clone . In a study of 1595 newly diagnosed MM patients, Yadav et al. found that higher sFLC concentrations were associated with an increased incidence of renal impairment at diagnosis, and patients with sFLC>800 mg/L had the highest risk of severe renal impairment (eGFR < 30 ml/min/1.73m2) (Figure 26.2.). 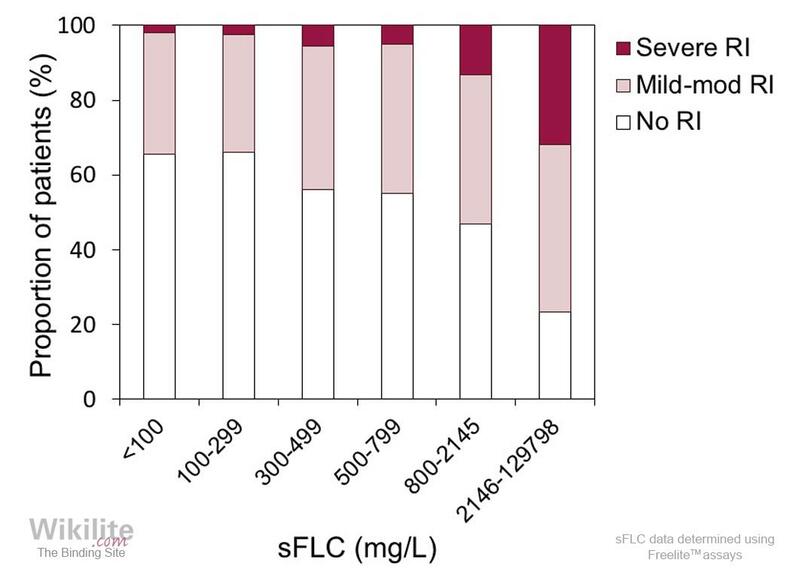 Consistent with this, the International Myeloma Working Group recommended sFLC analysis as part of a panel of laboratory tests to diagnose renal impairment in patients with MM, both at diagnosis and during follow-up (Section 25.3.7) . The pattern of renal injury in plasma cell dyscrasias varies considerably, and is influenced by structural properties of the individual monoclonal FLC, particularly the variable domain, as well as environmental factors such as pH or local proteolysis . Renal disorders that are associated with plasma cell dyscrasias may be classified into two major groups according to the predominant type of injury: glomerular or tubulo-interstitial (Table 26.1). Table 26.1. Main renal disorders related to monoclonal immunoglobulin deposition or precipitation. Table adapted from . Tubulo-interstitial disorders include cast nephropathy, acute tubular necrosis and Fanconi syndrome. Cast nephropathy is the most frequent cause of severe AKI in MM patients, causing up to 90% of cases . This pathology is discussed in detail in Chapter 27 along with issues relating to diagnosis and preservation of renal function in MM patients. A less common cause of AKI in MM is acute tubular necrosis . In this condition, proximal tubular injury is associated with an acute ischaemic or toxic event. In some MM patients, endocytosis of nephrotoxic FLCs may directly cause proximal tubular cell injury and necrosis . 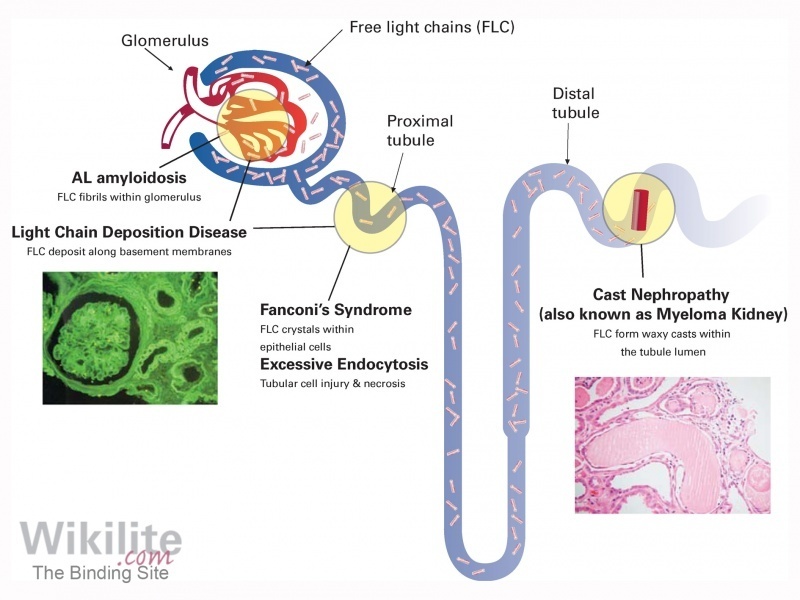 Fanconi syndrome may be due to proximal tubule dysfunction secondary to reabsorption of FLCs that are resistant to proteolysis and crystallise within epithelial cell lysosomes. This dysfunction leads to a loss of solutes, including phosphate, glucose, amino acids and bicarbonate and is characterised by renal tubular acidosis . Interestingly, this is nearly always associated with FLCs of the Vκ1 subgroup, derived specifically from only two germline genes: IGKV1-39 and IGKV1-33  Leung and Behrens  recently published a comprehensive review of myeloma-related kidney disease. A similar spectrum of kidney disease can occur in Waldenström’s macroglobulinaemia (Chapter 32), but the proportion of patients with kidney involvement is lower . AL amyloidosis and LCDD are often associated with glomerular damage, albuminuria and progressive renal impairment. Whilst LCDD is frequently associated with MM (65%), AL amyloidosis is less frequently observed (10 - 20%)  The kidney is the organ most affected in LCDD, with severe renal impairment evident in the majority of cases at presentation. The kidneys are adversely affected in approximately 75% of AL amyloidosis patients, the majority of whom present with heavy proteinuria, often with a nephrotic syndrome . AL amyloidosis and LCDD are considered in more detail in Chapters 28 and 29 respectively. Finally, it is important to note that more than one histological pattern can exist in the same kidney. The most common combinations are cast nephropathy with acute tubular necrosis, and cast nephropathy with LCDD .